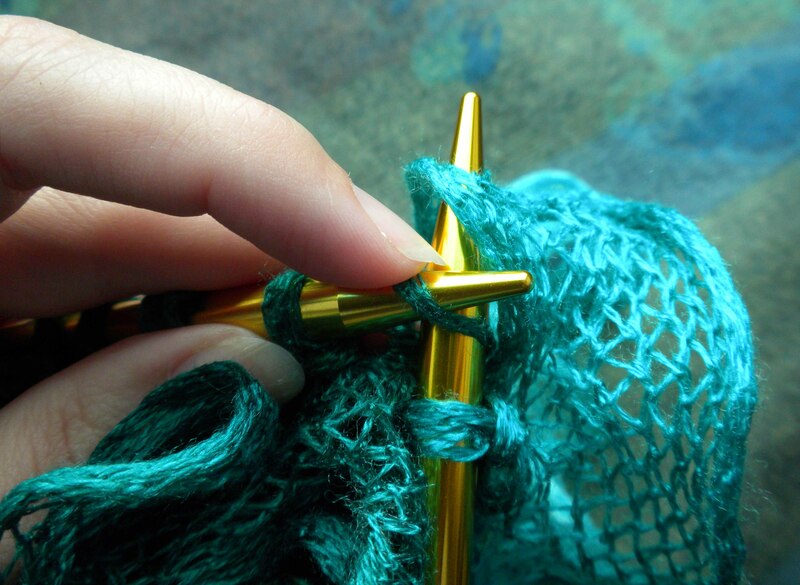 I am not generally one for novelty yarns – sure they made me giddy inside as a new knitter, but as I progressed I became interested in showing off my work more than hiding it in fringe, eyelashes, bobbly bits, etc. However, when a friend of mine who owns a craft store brought in a tantalizing sample of Creative Can Can by Rico Design I was intrigued. Visions of whipping out fabulous swishy scarves with a minimum of effort danced in my head. I pictured my cold necked friends, long deprived of hand knit scarves, wondering how I managed such a complex looking scarf and nominating me for knitting sainthood, while I scuffed my shoe and humbly told them it was worth it for them. Remember in my Don’t Take My Needles Away post I said I took a scarf to Croatia? Well, this is the scarf I took. So, it might have been the fact that I was freezing, hacking on second hand smoke while listening to Croatian techno music and choking on hooch from a Coke bottle foisted on me by the “tour guide” while trapped on a dilapidated boat in the middle of the Adriatic that made the sting of disappointment so keen as I realized that this wasn’t going to be the quick and easy scarf I dreamed of. Unfurling the yarn before knitting. Knitting into the top edge of the yarn. Other challenges: Several times I had to untwist the yarn (and I’m not talking one or two twists either), but I’m not sure if that was caused by user error, I’ll let you know if/when I work up the other two balls I bought. Also, at one point the ribbon tore, the top edge separating from the rest, so I had to break the yarn and start again, lest the whole thing unravel. 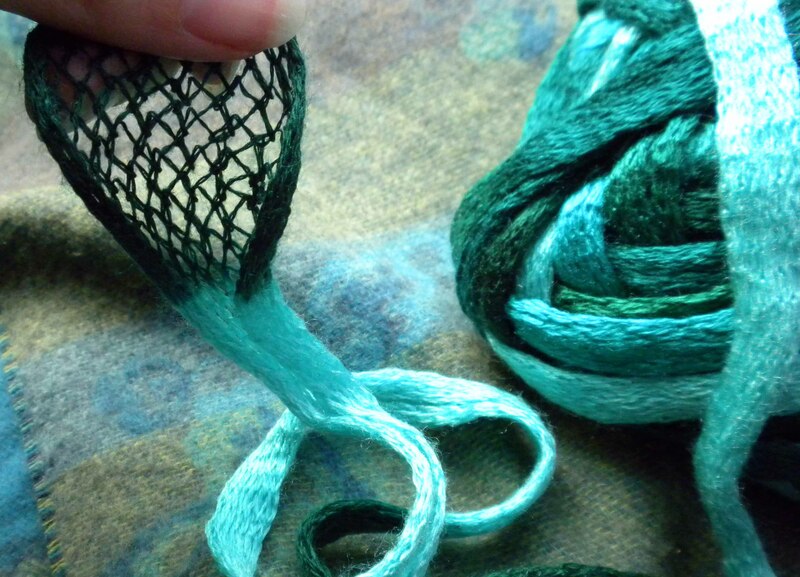 I think my talon-like thumbnail was the culprit as I tried to find a quicker way to open the yarn. In the end it took me probably six hours to finish the scarf – my dreams of a quick scarf were dashed on the cruel rocks of reality. 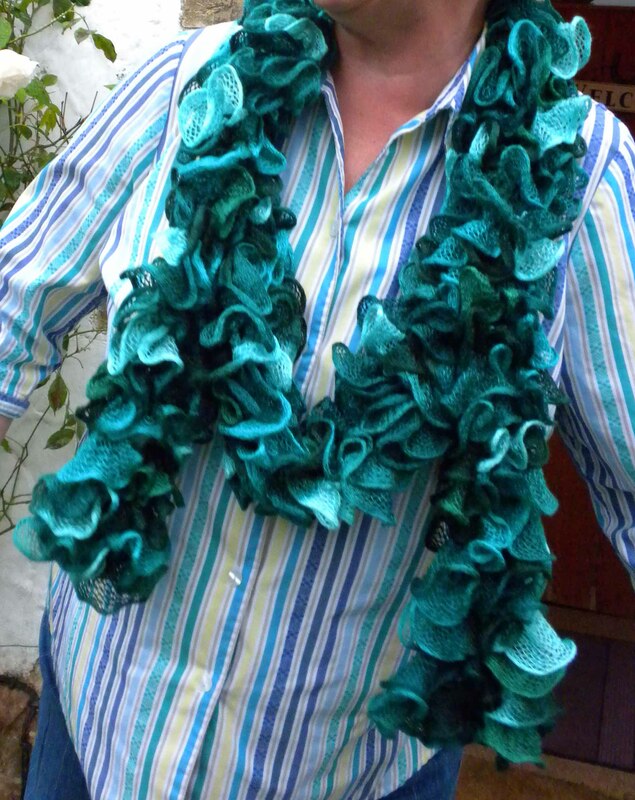 Don’t get me wrong, the finished scarf is full of fun, fabulous frippery. And if you don’t go into it with the expectations I had (which, now you won’t, because you know what to expect) you can’t be disappointed. But I wonder, can you really tell that it’s hand knit? Each 200g ball of Rico Design Creative Can Can yarn will make a good sized scarf. The yarn is made out of acrylic and the yarn band has instructions for knitting the scarf I knit. I followed them exactly, down to the 7 cast on stitches (which, interestingly isn’t done with a traditional cast on, but by inserting the needle through the yarn at the top edge). I used 7 mm knitting needles. The scarf can be washed on permanent press, cold. Lay flat to dry. Do not tumble dry, dry clean, or iron. No, you can’t tell. But that makes it all the more impressive to those who don’t knit! 🙂 I love the colors. Lovely idea and a lot of fun but each of my 3 balls of yarn had knots, breaks, and holes that required cutting out and then cobbling the joins together. I used a 6.5 needle and having seen one done with 7 stitches used 8/9. The frills need pulling out fully to achieve best effect. Won’t be in my wardrobe for very long but great whilst it lasts. .
Weaving in ends is a nightmare with Can Can! I saw the scarves at the Harrogate Knit and Stitch show and bought a ball. I was sure I wasn’t understanding how to knit this scarf and if I was doing it right because it seemed it would not be a quick process. Which is why I came looking for confirmation or, better still, the real way to do it.So I can see now that all this poking and prodding is correct. I’m thinking of much smaller accessories now! Its very fiddly yarn to work with. I prefer using the traditional yarns though the effects may not be so pretty. I like the yarn and haven’t had any of the problems mentioned here. Can’t wait to try another colour !! I thought I was going mad and doing something wrong, great to find this blog and know that rico can can does form knots and tangles, you spend more time sorting this out than knitting the scarf! Happily knitting away, about eight inches into my scarf, when I come to a split! one edge of the yarn is separated from the rest and the middle section is unravelling! My immediate thought was to take the yarn back to the shop but if this is a recurrant problem it seems a new ball may let me down too. I am thinking the best thing to do will be to stop the run with a nifty stitch, twist the yarn over and use this bottom edge as the top (taking in all layers) until I get past this section. What does anyone else think? It’s worth a try. You might check the ravelry forums too, there could be advice there. I just cut off the offending part and started again. It seemed to have worked, the scarf hasn’t split apart. 😉 Good luck. Hi all! I’ve made about 15 of these scarves and after struggling with 8mm needles on the first one (as reommended in the wool shop) i switched down to 4mm needles which made a huge difference. The biggest problem I’ve had has been joins and rips in the yarn: I wouldn’t recommend turning the yarn to avoid a rip as the yarn can stll ‘ladder’ at a later stage resulting in the loss of your beautiful scarf… better to mend the rip in matching thread, or return to the shop which I’ve done a couple of times and I’m guessing by the reaction it’s a common occurence! Thanks for sharing, Dee! I saw at a yarn shop that someone knitted it without unfurling the yarn. They used it more like a ribbon yarn. I guess they were looking for an alternative to the tedium; unfortunately, it was really short! I can see how it would be easier with the 4 mm needle and if I ever get up the gumption to try my remaining ball I will do it with 4 mm needles.